Arosa – the most popular resort with families and well-heeled 40+ crowd. This is a traditional Swiss ski resort in the German speaking part of Switzerland, situated 160 km south east from Zurich at altitude 1739 m, offers skiing area up to 2600 m.
It was built around Lake Obersee with no through traffic offers 225 km pistes, opening the door for more and more guests and becoming one of the largest ski resort in Switzerland. Arosa can boast a sunny location in the beautiful Schanfigg Valley and the largest ski area in Graubunden thanks to its new link with Lenzerheide. Arosa is rightly considered to be a peaceful location and family-friendly destination which has compact size. But what else can Arosa boast? We asked about it a person who knows Arosa as well as his own five fingers – Markus Guler, Sales Manager of Arosa Team Tourismus. – Markus, you work in Arosa, you know about this resort everything. Tell us, please, about location and history of the resort, its sights and natural peculiarities? In the 19th century, the village of Arosa almost disappeared off the map, offering its residents but a scant and harsh existence, until various individuals took the courageous steps needed to propel the backward economy of this isolated Walser settlement in the remote depths of the Schanfigg valley forward into the present. Thanks to its ideal location, in 1920 Arosa was transformed into a mountain spa resort, which brought tourists flooding into the beautiful village. With almost one million overnight stays per year, people today come from far and wide in search of rest, relaxation and exercise amidst our breathtaking mountain landscape, which we nurture and maintain with the greatest respect for nature. Arosa is now one of the best known and most popular holiday destinations in Switzerland. Offering an endless variety of extraordinary and increasingly innovative activities – both in summer and winter – Arosa is always at the top of the list for discerning holidaymakers. 225 kilometers of slopes, one of the biggest ski resort in Switzerland – it’s all about Arosa! – And snowboarders and free riders will be given an opportunity to enjoy the winter there? The Snow Park in Arosa has a great set up, which presents a perfect setting for fun and training. It is adapted to the unique landscape in the Tschuggen area and its exceptional features make it possible to combine various alternatives. Each Jibber – beginner or pro – will discover their own style in the park and there are no limits to what they can create. The Snow Park area is built in 3 lines with different levels of difficulty. This winter a mini pipe will be added to the Park – yay! The Shape crew create new features regularly which provides lots of fun alternatives. – How large and modern are accommodation facilities? – Does the resort mainly offer hotel, residence and/or chalet accommodation? And could you name the most popular of them? Both: 3433 beds in hotels, 3100 beds in holiday apartments. Tschuggen Grand Hotel with spa designed by Mario Botta – Arosa Kulm Hotel, Bellavista, Hof Maran, Belarosa and more. – What basic skills and new trends can your ski schools teach children and adults? 3 ski schools for children and adults. We have a special offer: Ski school included. During the winter season 14/15 all group and ski and snowboarded classes are for free for guests up to 17 years. This offer is valid as of a 2-night stay in many participating Arosa hotels and holiday apartments and for the snow sports schools of ABC and SSSA (Swiss Ski and Snowboard School Arosa). – Okay, so what about the facilities for young people? Arosa can offer a wide range of bars, clubs, cinema, ice-hockey matches etc. – And what does the resort offer for families? Just 3 words – Arosa JUNIOR Club (club for the smallest of the guests, which offers specially equipped ski kindergartens and the most professional team of skiing instructors for the youngest of the children – editor’s note). – Is the weather stable there? And can we be sure that snow will be there for a long time? Arosa guarantees snow during the whole winter season. You will be surprised but in the last 10 years an average quantity of fresh fallen snow was 6223 meter. 60% of tourists are from Switzerland, 25% – from Germany, 5-7% – from Benelux and 8-10% are from other countries. – Markus, do your guests can visit some social and sports events or festivals there? Of course, there are AHF (AIDS Healthcare Foundation, a nonprofit provider of HIV prevention services, testing, and healthcare for HIV patients), ISF (International Snowboard Federation/ International School Sport Federation), horse race on frozen lake Obersee, Arosa Music Festival etc. – How do we get Arosa? – What can the resort offer as aprÈs-ski? – Are there any special offers for ski-pass purchase for different categories of tourists? Different prices in different seasons, special prices for families and seniors. – What’s new can be expected from lift stations? 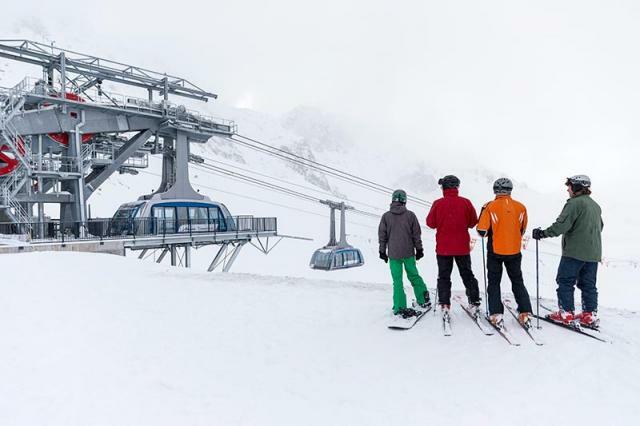 New connection of the ski areas Arosa Lenzerheide since 18th January, a modern cable-car connects the two valleys.